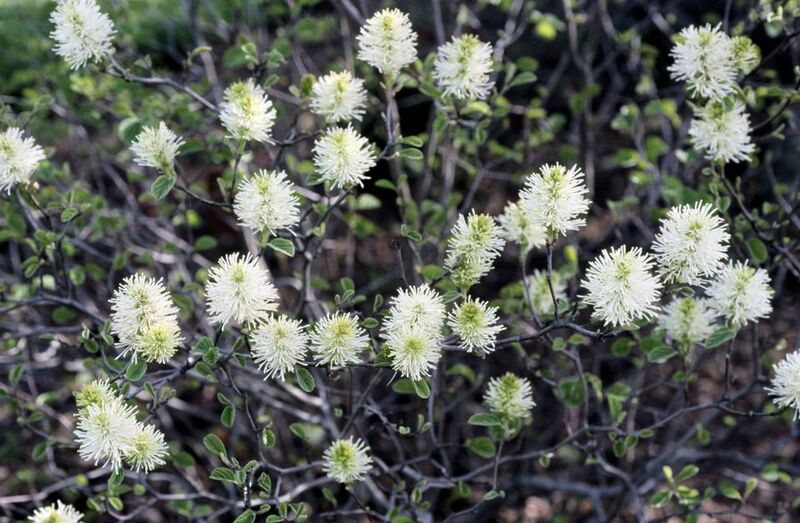 Dwarf fothergilla is one of those shrubs that serves double duty. The bush has landscape value in both spring and fall. Growers always on the lookout for the unusual will be drawn to the odd fragrance of its blooms. Learn how to grow this North American native so that your own yard can profit from its selling points, not the least of which is its compact size. Plant taxonomy classifies these dwarf fothergilla shrubs as Fothergilla gardenii Mount Airy (Mount Airy is the cultivar name). Fothergilla gardenii is classified as a deciduous flowering shrub. The genus name (when it doesn't begin with a capital letter) essentially functions as one of the bush's common names. The Mount Airy dwarf fothergilla shrub has an upright growth habit and reaches 3 to 5 feet in height, with a similar width. In spring, this shrub is tipped with white flowers (1 to 3 inches long) that have the appearance of little bottlebrushes, which is why "bottlebrush" is another common name for the shrub. The flowers, which bloom in mid-spring or early spring, smell a bit like licorice. The leaves will remind you of witch hazel, to which Fothergilla gardenii is related (they both belong to the Hamamelidaceae family, along with, for example, Loropetalum). The irregularly shaped, ovate leaves are toothed along their margins and 2 to 4 inches long. In summer, on top, they are dark green; the undersides are bluish-gray. The species shrubs are indigenous to the American Southeast. Mount Airy can be grown in planting zones 5 to 8. Plant these shrubs in full sun to partial shade. They grow best in moderately moist but well-drained ground that has a soil pH on the acidic side. Fertilize them with compost. Despite the interesting "bottlebrush" flowers in spring, most gardeners are more drawn to the superb fall foliage of Mount Airy dwarf fothergilla shrubs, which rivals that of such autumn stars as Virginia sweetspire bush. The fall color can take on various hues (orange, yellow, green, purplish), sometimes all on one leaf. Due to its colorful fall foliage, this bush merits specimen plant status in the autumn landscape. Since, like Fothergilla gardenii, they prefer acidic soils, shrubs such as mountain laurel and azaleas and rhododendrons make good companion plants. Mount Airy dwarf fothergillas are also suited to woodland gardens. A hedge composed of these bushes will attract attention in both spring (due to the flowers) and autumn (due to the fall foliage). Fothergillas do tend to spread via suckers. If you wish to limit their spread, remove the suckers as soon as you discover them. If, on the other hand, you want more of this plant, its suckering tendency makes the job easy: Simply dig up (getting as much root as possible) a sucker and transplant it to the desired location. Since it blooms on last year's growth, prune after the flowering period if you truly need to prune (alternatively, if you do not mind losing a few of next year's flowers, you can prune when the bush is dormant). But dwarf fothergilla requires only minimal pruning. If branches are rubbing against each other in the inner part of the plant, you may wish to prune to "open up" the shrub. But avoid pruning it so as to give it a uniform shape: It is more appealing when it sports the "wild look." You can trim off dead branches at any time of the year. Fothergilla strikes people as a curious name, while gardenii is deceivingly familiar. So let's take a closer look at how the full scientific name (Fothergilla gardenii Mount Airy) breaks down. Surprisingly, the two names share a similar origin, and neither has anything to do with the traits of the plant. Both the genus, Fothergilla, and the species, gardenii, are named for people, and both happen to have been physicians. The word gardenii has nothing to do with gardens in this case. The cultivar name of Mount Airy comes not from the famous town in North Carolina of that name, but rather from the name of the Arboretum in Cincinnati where the cultivar was discovered, according to the Clemson University Extension. People disagree on how to refer to this fothergilla shrub, in terms of a scientific name. The most common classification is Fothergilla gardenii Mount Airy. But you will also see Fothergilla major Mount Airy. Since the Mount Airy cultivar is a hybrid of Fothergilla gardenii and Fothergilla major, another botanical name that you may see for it is Fothergilla gardenii x major Mount Airy. With such confusion over the correct scientific name, you will be glad to know that most plant lovers will know what you are talking about if you use the common name "dwarf fothergilla," and/or mention the cultivar name "Mount Airy".